God, the Creator of the heavens and the earth, created it not in vain. He formed it to be inhabited by people who love him and each other more than anything else in the world. God wants a family who worship Him in spirit and in truth (John 4:4) and He knows what He’s doing. Isaiah 45:18 For thus says the LORD that created the heavens; God himself that formed the earth and made it; he has established it, he created it not in vain, he formed it to be inhabited: I am the LORD; and there is none else. Reading the Scriptures takes time and effort. It takes comparing line with line, learning a little here and a little there. Those who search for truth diligently are rewarded abundantly. Those who just brush the Scriptures from time to time will never capture the richness and depth God’s Word offers. God’s Word truly contains the truth and everything we need to live in this world. It reveals God’s plan through the ages which culminate in “the consummation of the ages.” At that time, God will be all in all as he has promised in His Word of truth. I Corinthians 15:22-18 For as in Adam all die, even so in Christ shall all be made alive. For he has put all things under his feet. But when he says all things are put under him, it is clear that he is excepted, who did put all things under him. Can you picture a perfect creation where everyone loves God and each other? A creation where no evil exists? No thefts, no rapes, no murders, no manipulation, no jealousy, no accusations and no conspiracies? It’s hard to imagine that living in this present evil world. Whether we can picture it or not is irrelevant. It will happen. One day our God will be all in all and the entire creation will rejoice in righteousness as the light of Christ shines upon and within us all. This is the ‘good news’ of the Bible. The true gospel (good news) message is that Christ is the savior of all mankind with no exceptions. If the blood of Christ is the payment-in-full for the sins of the world, then who are we to lay claim that anyone’s sins are still to be imputed? This line of theology, that Christ is only the savior of some, is devoid of Scriptural authority. If you don’t believe me, check out these verses. I Timothy 2:4 [God] Who will have all men to be saved, and to come unto the knowledge of the truth. Does God accomplish His will? Of course, nobody can thwart his will. Most of the time people change “will” in this verses to “desires, hopes, wishes” but even if they want to change God’s Word, He says in it that He will accomplish all He desires! People teach this verse as if it says, “God who will NOT have all men to be saved.” Don’t put that word NOT in there and believe exactly what it says! I John 4:14 And we have seen and do testify that the Father sent the Son to be the Savior of the world. John 4:42 And said unto the woman, Now we believe, not because of your saying: for we have heard him ourselves, and know that this is indeed the Christ, the Savior of the world. The word, “propitiation” means “payment-in-full.” The full payment having already been paid, there is nothing left to pay. Mankind is redeemed — but each in their own order as stated above. I checked the word “especially” and it does NOT mean “exclusively” or “only” or anything like that. God will save all men (put for mankind, men and women), ESPECIALLY those who believe. Now what could that mean? God is calling out His elect right now. For there to be an “elect” group, there must, at some point, be a ‘non’ elect group (otherwise elect means nothing). Those who readily believe now, God foreknew and called, justified and glorified. Romans 8:29, 30 For whom he did foreknow, he also did predestinate to be conformed to the image of his Son, that he might be the firstborn among many brethren. We Christians are the firstborn to be taken out when Jesus returns for the church. Next comes the first resurrection at Christ’s return with us. Those too are called ‘elect’ of God. We, the elect, live and reign with Christ as kings and priests for 1000 years during the millennial Kingdom. After that is the Great White Throne Judgment during which all the ‘non’ elect will be judged. During that period, the ‘lake of fire’ will purge all carnality from these unbelievers and when they have been purified, they too will enter God’s Kingdom by finally believing and confessing Jesus is Lord. How do I know this? Romans 14:11 For it is written, As I live, says the Lord, every knee shall bow to me, and every tongue shall confess to God. These verses tell us flat out that every knee shall bow and confess Jesus is Lord! God would not be glorified if this was not by the person’s own choice. He isn’t going to ‘force’ people to confess Jesus is Lord and then send them into eternal torment! If they don’t believe now, they will believe at the consumption. Muhammad will bow and confess Jesus is Lord. All the Muslims will. Hitler will. All the satanists will. Everybody who has ever lived will. That’s the Word of God, not my own impression or conclusion. It’s clearly stated. Now here’s the kicker – even the angels will be redeemed. Acts 3:21 Whom the heaven must receive until the times of restitution of all things, which God has spoken by the mouth of all his holy prophets since the world began. Colossians 1:20 For in Him [Christ] the entire complement delights to dwell, and through Him to reconcile ALL to Him (making peace through the blood of His cross), through Him, whether those on the earth or those in the heavens [i.e. angelic beings who are lawless now]. Is anyone or any angel left out? Of course not. All in heaven and on earth will believe, confess and be redeemed. John 6:44 “No one can come to Me if ever the Father Who sends Me should not be drawing him. And I shall be raising him in the last day”. How many? ALL! The word “draw” actually means “to drag.” Jesus is going to “drag” all mankind unto himself, every single person who has ever lived. Can it be said any clearer? The “all” who died or are dying in Adam are the same “all” that shall be “vivified.” Vivified means to be made alive and this is permanent. When you really get this your love and adoration of our Father God Almighty will explode. He is saving the whole creation! Absolutely nobody or anything will be lost. This is the true “good news” not that only believers now are saved, there is no chance to believe after you die, and if you don’t you’ll either die eternally or burn and be tormented for billions upon billions upon billions upon billions of years. Wow! I had to share this with you! Praise God in the Highest! Exalt His name above all for He truly is in control of all – so do not worry about anything. He is in control. Everything will work out for good for all eventually! 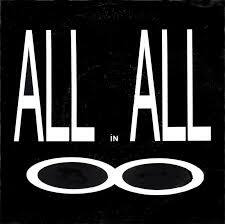 God will indeed be “all in all” and this is marvelous in our eyes. Rejoice!